Can I invite you to the most unique and remote mountain lodges in Washington State? It is called Chief Joseph Lodge and sits dead center in the middle of the state and five miles up from the summit of Blewett Pass highway. Click here to take a look. (ChiefJosephLodge.com)ChiefJosephLodge.com. There are photos, videos, maps calendar and rates. In fact, it is so far off the road that in winter we have to send a 10 person snow cat to pick you up at the nearest road. Yet it is just a 2 hour drive from the Seattle area. Just 30 minutes from Leavenworth and 30 from Roslyn Cle Elum. Or you can snowmobile in with your group. In summer you can drive a quiet mountain lane to the front door. The place sleeps 14 people in rustic log beds and everyone can have the kind of mountain experience most folks only dream of. Bring your family, bring your group and leave your stress behind. Built of hand scribed logs this 5 bedroom, 3 bath giant is completely off the grid, but has its own high tech silent generator You'll probably just sit back in the cathedral ceiling great room, or lounge on the deck and marvel at the sights. You can toast your toes in front of the massive stone fireplaces. But there is fun here too. Satellite TV brings the big game to the multiple big flat screen televisions. 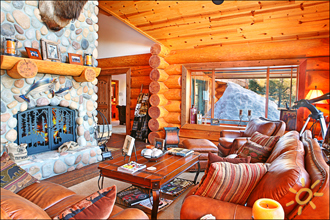 There is a pool table, pine ball machine and all that rugged outdoors to hike, ski and explore. The kitchen has all conveniences and even cowboy saddle bar stools. And the place is full of western memorabilia and trophies. The kids will love it. Chief Joseph welcomes everyone. Bring your family, bring your group. But leave your stress behind. P.S. You may be wondering about the name. It is documented that Chief Joseph, the Nez Perce Native American Chief who spoke the immortal words of "I will fight war no more forever" actually passed over Blewett Pass and stopped long enough to water his horses and buy supplies. We like to think he picked this very spot because of its beauty and majesty. You will probably agree.